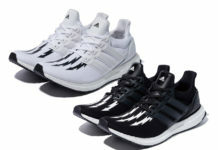 Mache Custom Kicks and San Francisco-based technology company Chronicled have hooked up together to designed a 1-of-1 Kanye West Fathers Day adidas Ultra Boost Custom for Ye and even including his daughter North. Just in time for Father’s Day, the adidas Ultra Boost for Kanye comes in a military looking vibe with a Green-based upper and Bright Orange accents hitting the Pablo-style “Kanye West” lettering. North received a Bright Pink pair of adidas Superstars that receives an all-over compass print in Gold. Both pairs are equipped with a Chronicled tag for authenticity. Check out the additional images below of this Father’s Day gift and let us know what you guys think in the comments section. How many of you would scoop up the adidas Ultra Boost if they became available?